Team - AA4NC, K5DHY, N2IEN, VA3QR, W4DKS, WA4DAN, WW2DX. They will operate on 160 - 6m CW, SSB, RTTY, EME, SAT, FT8. Information from Randy Rowe, N0TG. 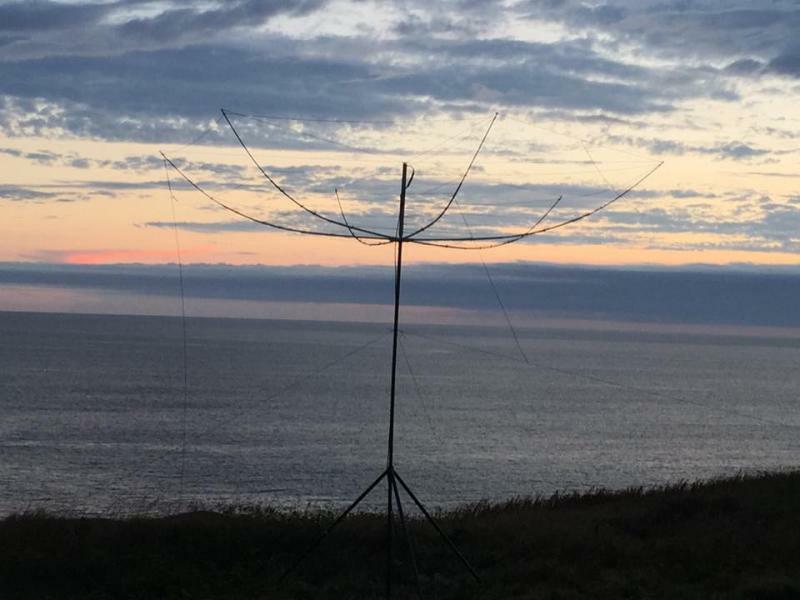 The [CY9C] dxpedition scheduled for August 1-9 has been cancelled. After considerable analysis and discussions as to expected band conditions, the "need-list" ranking significantly greater than 50, and in order for the team to achieve our goals for maximum Q's and ATNO(s), dx'ers would be better served if we postponed the dxpedition. We look forward to a future St. Paul dxpedition effort when conditions significantly improve. The departure plans for the CY9C DXpedition team have been finalized. Limited operations have taken place at the Northeast Island this morning but will be shut down soon. The Atlantic Cove team has two stations operational until late this evening. The team helicopter is flying this morning and will continue today as it is taking most of the electronics back to Dingwall. The boats will be coming to Atlantic Cove late this afternoon and loading a lot of the gear stored on the island. Shortly after sunrise on Monday morning the boat will take the remaining ops and gear off the island officially closing the CY9C DXpedition. The team reports approximately 60K contacts in the log. A final tally will take place after the conclusion of the DXpedition. Today and tomorrow will be very hectic for the team but an update will take place Monday afternoon or evening. Departure plans from St Paul Island have come into better focus this afternoon. The plans are for the Northeast Island team to depart the island on Sunday morning. Some of the Atlantic Cove team will also be departing their island on Sunday. Three operators will remain at the Atlantic Cove site until Monday morning. Three boats from Dingwall will arrive and loading of all of the gear will take place. The three operators who remain on the island will stay active on the bands until first light on Monday (0900). Several antennas will remain active including the Battle Creek Special antenna. Emphasis will be placed on 160 meters. The total QSO count as of this morning is 56,789. One more update will be issued on Sunday morning as the plans are all weather dependent. The CY9C team is nearing 55K contacts in the log as of 1200Z on Saturday, August 27. Operations are continuing as both islands have multiple stations on the air. St Paul was hit by an intense thunderstorm at 0300Z this morning. Operations were disrupted but all is up and running this morning. Because of impending bad weather on Monday, departure from St Paul will be a day early and will occur on Sunday. Operations will shut down sometime Saturday evening or very early Sunday morning. This is a fluid situation so we will update as necessary. The team is tired but otherwise in good spirits. As of 1200Z Friday morning the CY9C DXpedition team has totaled 45,000 Q's in the log. The team is pushing hard for 50K Q's. Band conditions are average but a few Europeans were worked on 12 meters this morning. Ten meters is checked everyday and CQ'S are made on 28.395. So far there has been one day of short skip on ten. The team is using a Hygain 5 - element 10 meter monobander. The weather has turned rotten again with rain and wind. Plans are being readied for the breakdown of the two island camps later in the afternoon on Sunday. Operations will continue until that time. The helicopter is off the island right now. Weather conditions will determine when it returns. Both teams are doing well. Propagation will determine the operating strategy until shutdown. The weather and band conditions greatly improved for the CY9C DXpedition team on Wednesday. 10, 12 and 15 meters were open and the team took advantage of the improved conditions. As of Thursday morning, the CY9C team reported approximately 38K QSO's in the log. On Wednesday the team EMT on Dingwall flew to the island and checked each operator. All operators were in good condition. The team will emphasize 10, 12 and 15 meters if the band conditions allow. Lee WW2DX made 800 Qso's on 6m today. Will Roberts AA4NC and I have been hitting 10/12/17 hard today. The CY9C team surpassed the 30K Q total on Tuesday. Band conditions improved and the team took advantage of the conditions. 15 meters opened and Europeans were added to the log on that band. 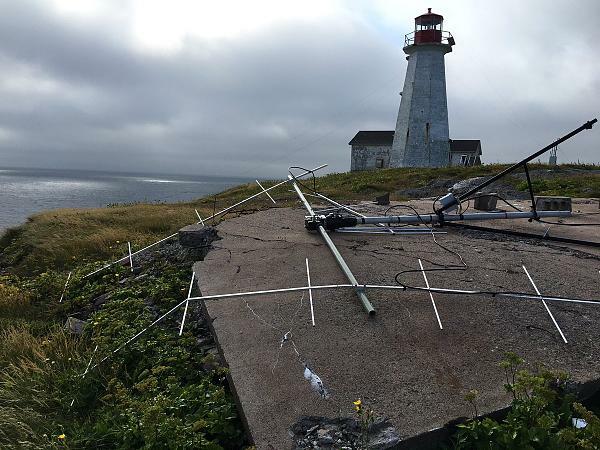 Due to the high winds on Tuesday, the team made repairs to one antenna and moved another antenna. Weather conditions on Wednesday morning are good and the team is encouraged. Depending on sea conditions, a boat may arrive today to take any unneeded equipment and materials back to Dingwall. The team is able to have two stations on the same band and same mode. The distance between the Northeast Island and Atlantic Cove, and the terrain of the island, make that possible. Additional updates will be issued as needed. The CY9C DXpedition team continues to work the pileups. The team reports no propagation on 10-15 meters. Propagation on the other bands is a challenge but the team is doing their best to add as many contacts as possible to the log. All antennas are built and operational. Weather has been a factor with winds and rain. The team has settled into a daily routine and working the bands that are open. Due to unexpected issues, real time logging to Clublog will not be possible. Three tons of gear were successfully transported to the St Paul team on Friday. This was accomplished using two boats and seven helicopter runs to the island. Another boat is scheduled to transport additional gear this afternoon. At least two helicopter runs are scheduled later this morning. We hope to have both islands fully supplied by late afternoon/early evening on Saturday. The Northeast Island team is essentially supplied while the Atlantic Cove team still needs essential gear. We hope to have both sites fully operational by Saturday evening. Weather is marginal today so we will have to wait to hear from the boat captain and the helicopter crew. All team members are on St Paul except for WA4DAN who is assisting with the helicopter and boat logistics. 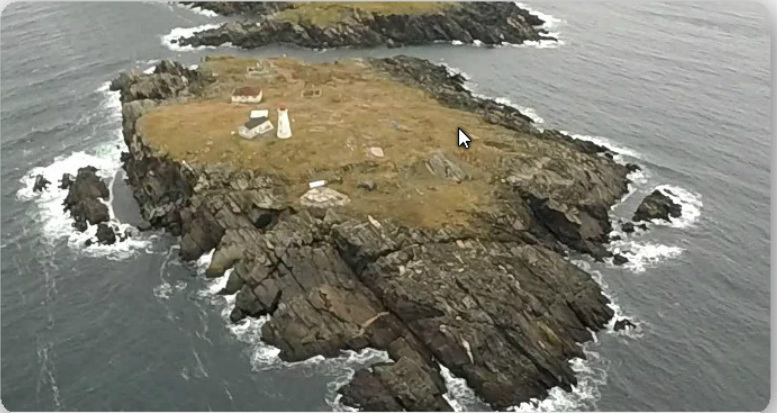 The helicopter is stationed on the Northeast Island for the duration of the DXpedition. The team expresses it's gratitude to the tireless efforts of the helicopter and boat crews in this massive effort. More updates will be issued as needed. The CY9C DXpedition team made it to St Paul yesterday with very limited equipment. WA4DAN and VA3QR are in Dingwall handling logistics and sorting gear for transport to the island. Unfortunately, both St Paul and Dingwall have been raked with thunderstorms overnight and this morning. At 1130Z this morning, two boats departed the docks in Dingwall with several thousand pounds of gear. Because of the rough sea conditions, it is not certain that a landing will be possible. The area is still experiencing heavy rain and sharp lightning. The helicopter is grounded until the weather improves. All of the radio gear will be transported via the helicopter. Hopefully that will occur later this morning or early afternoon. We will keep everyone updated. Right now we just need better sea conditions and VFR weather for the helicopter. The CY9C team is all assembled in Dingwall, Nova Scotia. We are currently configuring all of the laptops. The helicopter is in position on the grounds of the motel that overlooks the water. We have a view of St Paul on the horizon. It rained all night and we continue to have light rain. The weather forecast for tomorrow looks outstanding. Hopefully the forecast holds! WW2DX, Lee, who will include 2 Meter EME, Satellite, and 6 meters to the DXpedition operation. RTTY from this site will be provided by N2IEN, Pat, and W2RE, Ray, will be adding to the SSB operation. This completes the staffing for 11 operators total. Northeast Site with 5 operators assigned and Atlantic Cove 6 operators. As was reported previously, we will have two separate sites...separated approximately 1.5 miles. Site 1 will be the Atlantic Cove site with 6 operators. We will try to keep 4 - 5 radios running and more if 12/10m opens. Our plan is to have a RTTY station active at all times. From this site 160 will be given lots of attention with the Battle Creek Special antenna. 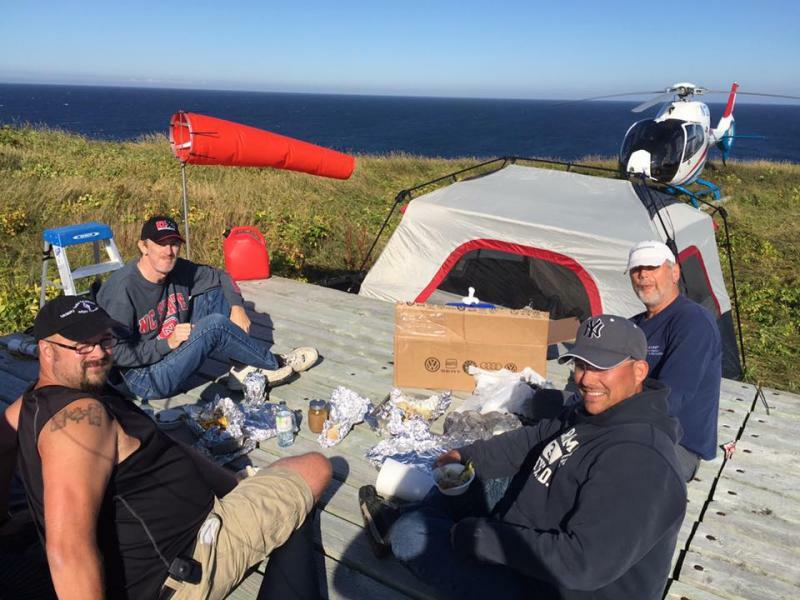 Site 2 - the Northeast Point separate island will be enhanced to include 4 -5 operators active at all times, thus the dxpedition in total can potentially have 8 -10 radios working most of the time. We are seriously considering 6m EME and Satellite, however, we need to work out the planning details. And, as always, budget matters are a significant consideration as we expand operations. We appreciate the support by many to date. The desire is to make this a very complete operation that will offer fun and meeting needs for all interests. CY9C. Where Saint Paul Island is located. Map. Thanks for doing this. Working splits helps with hearing. I got you guys on 4 bands. Last night 160 was just opening up to the west coast at 0430Z and they worked big gun K7ZV, and called CQ a few times then all stations went QRT for the night. Checked back at their sunrise, and no 160 meters. That would have been the best time for the west coast. Maybe tonight, our last chance. Thanks so much for the QRPp contact. You are a great bunch! God speed - 73 to all. Tough propagation for any DXpedition lately on long runs, no doubt. Very happy to have worked SSB on three bands and to have been 1st QSO for 17m with Wayne and the HexBeam just on the air. Many thanks & 73. Tnx for the nice service. I am very happy to get 1st QSO with CY9. Tnx agn!! The worst DX pedition of the 21st century for Aisa. Hi to All, Many thanks,for contact in more freq. 73,s Good Loock. Why did you completely ignore the work with Asia, the Japanese direction? The best time on the 30-40-80 for Asia you work at Europe and America only. Do we have a chance? What no fishing polls. lol.